All of us are working towards some goals. All of us have some plans for our life. 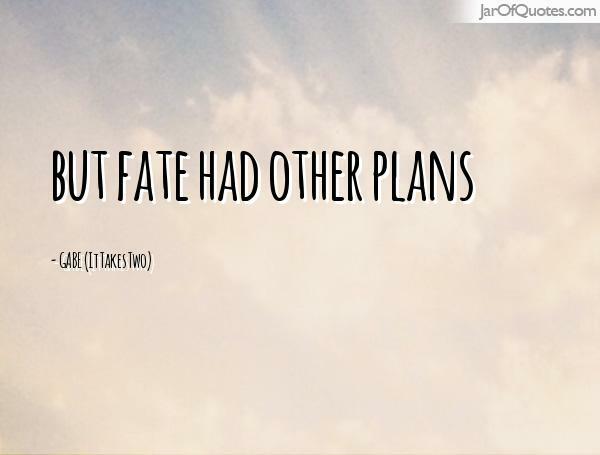 Fate changes plans. We plan for our future, our children, our career and retirement. We are always planning and trying to implement our plans. While doing all this, we forget to count fate, and that can give us a shock if we are not ready for it. When one makes plans, one should always leave the results to fate. Otherwise the shocks can be disastrous for our equanimity. Let us see how. Some people don't believe in fate. How do these people justify few occurrences? For example, why some kids get cancer at a very early age? Why, a person who takes care of his/her health in all the possible ways, is suddenly diagnosed with impossible sounding diseases? Why does one person survive in an accident while the other person traveling with him/her dies on the spot? Why some people instinctively leave some place, a night before a natural calamity? We hear of so many such miraculous survivals and cruel deaths, that the role of fate becomes impossible to deny. A journalist who goes out only to fulfil his/her duty gets kidnapped in a foreign country and is killed mercilessly. Why? Few others make all the plans to go to the same place, but change their plans on the way! Which power makes us act in ways that either help us survive in a disaster or pull us towards one? It is fate. Isn't it? What should we do if life is such? We surely cannot stop planning about our future? We surely cannot sit at one place and let fate play its own game. And after thinking about the games fate plays, one cannot plan and be absolutely certain that things will turn out precisely as planned. What is the best way to live life? Let us plan. Let us apply all our might to bring the plans to fructification. Let us fight against all the obstacles and try to reach the goals. Let us do whatever we can to achieve what we desire. Let us leave the results to God. To dream of results and be sure that they will be fulfilled as per our plans may give us a bigger shock, if that does not happen.